I’d guess I’d follow the idea in the beginning of Scott Farrar’s post and start with proofs with numbers. Name my priors: I think introducing proofs with numbers and/or counting is easier for kids to understand, though I can’t prove that. Introducing proofs that way also gives you a chance to build up some number sense as well as get some arithmetic review in. Kids can have a great time with these problems and have lots of good ideas about numbers, too. At school level there is a real need to kill the formal approach and cosider more the logical sense of any argument or reason. Also, what a waste of time to have to prove that vertical angles are equal in size. The obvious should be considered accepted. I know that “common sense” can lead one astray, but a counterexample or two does help. Purple math needs a brain transplant. What a mess. This can be done in about four lines. Well, five, maybe. Aspirin/headache activity: my goal is a student led conversation about mathematics every day. Daily activity will begin with a problem, event, puzzle, conundrum. Then comes the sense making. The “headache” comes from cognitive dissonance on the student’s part: it should work, it doesn’t work; I should be able to do this, but I can’t do this; this looks like it should work for all of these shapes/problems/puzzles because they look so similar- it doesn’t, so where did I (the student) go wrong. In all of the examples given by others (many of which I have stolen and plan to use. Thank you!) I see cognitive dissonance. Students have to resolve this, for their own peace of mind. The situations that we create must have the students make an assumption that they then must explore. I see shades of the 3act process, but instead of just questions, students begin to build their own evidence, and cease to do the “math” based on numbers they have been given. They don’t get to watch the answer unfold- it is their work that they now watch unfold. There is a tremendous satisfaction in observing what has been created and in analyzing/talking out with others, building new knowledge out of resolving the cognitive dissonance. These are simply my observations. I plan to use this thought process to build some of the conversation starters I am going to use this year. I hope this helps further this excellent conversation. Howard: “Also, what a waste of time to have to prove that vertical angles are equal in size.” — I completely agree! What a bad PR move for proofs: seeing them in their most useless light. Dan, I like your idea: starting with the Rhombus. We often immediately use triangle proofs to justify propositions about quadrilaterals; so then look to the quadrilaterals as our introduction. Textbooks traditionally provide the aspirin (tool A) chronologically before the headache (concept B) so that a reader can turn the pages and theoretically proceed linearly. Touches on a lot of all the wrong things. In going through “the perfect textbook” a reader theoretically has all the answers given to them just in time; there should be no questions then. Therefore, any questions that arise must be a result of not following procedure accurately. So I like the reminder that we need students to not think like a machine, and not think procedurally. We need students to create the procedure, and I think the headache/aspirin metaphor does well to help us teachers remember to provide them opportunities for productive struggle. I generally buy into a theory of need. I like your approach for proofs, and I think always/sometimes/never provides a similar need for certainty. I think the headache for “simplifying sums of rational expressions with unlike denominators” could be a graph. If I type that equation into desmos, I notice a vertical asymptote at x=6, which makes sense. But I also notice that there is not a vertical asymptote at x=-1, and I thought there would be. Plus there is an x-intercept at x=4, and I have no idea why. This graph creates a need for explanation, and simplifying sums of rational expressions with unlike denominators provides the explanation/aspirin. • Maybe this happens more often in Math Circle-like environments than in geometry classes, but: I tend to fall into the trap of having lots of impossibility proofs, since those are usually more satisfying than yes-this-is-possible examples. But eventually your students notice the pattern and start immediately assuming things are impossible, which is a bad habit. You want to mix things up as often as possible with possible-but-difficult constructions, but these are hard to come by. Like, I know dozens of proofs that you can’t tile something, but how many tiling problems *do* have solutions which aren’t immediately obvious? • On solo or small group problem sets, it’s kind of a bummer when students choose the obvious-but-wrong answer on “Does X always happen?” problems and submit a short-but-flawed proof. It’s a learning experience, sure, but now they’ve lost the opportunity to struggle with this hard problem because they settled too quickly for a wrong answer. So sometimes I just tell them to “Prove Y” when Y is sufficiently surprising. The surprise that Y could be true is a pretty good headache on its own, maybe. I can’t resist linking to my (brief) thoughts on CPCTC — can we please remove this from the school math lexicon? Let’s not restrict mathematics or the role of proof therein to dealing with doubt. Name my priors: I think introducing proofs with numbers and/or counting is easier for kids to understand, though I can’t prove that. Thumbs up. I’m a big fan of finding the sum and product of three consecutive whole numbers. Some truly surprising properties (to me, and several other math teachers) arise. I acknowledged the breadth of purposes the proof act satisfies. But this headache metaphor is explicitly tied to Piagetian ideas of cognitive dissonance — order arising unexpectedly from disorder or disorder arising unexpectedly from order. While “proof as verification” falls along these lines, you’d have to clarify how the other approaches create this dissonance, if you’re posing them as headaches. Shoot, it’s worth putting these two comments side by side in their own post. Every headache so far has generated from an easier, more concrete act than the one we’d like to teach. Cognitive dissonance is easier to generate if students first feel confidence in some belief or skill. So I’m wondering if a student who doesn’t yet know how to simplify rational expressions would feel sufficiently confident in graphing those expressions to make that the basis for dissonance. Dan, I suggest your readers, if not you, would do well to check out de Villiers book. Proof solely as verification has had far too many innings in US mathematics education over the last century, and the Math Wars only served to reinforce for many traditionalists the notion that since proof can ONLY be for the purposes of verification, any high school geometry course (after all, where ELSE would/could proof arise in the K-12 mathematics curriculum?) that fails to focus on proof (as verification) is a watered-down/dumbed-down course offered by math teachers who hate and/or avoid math. I’m certain one of your fiercest critics, Mr. R. H. of Florida, would concur with that sentiment, as would the two mathematicians he seems to admire and concur with on every policy issue – Wayne Bishop and R. James Milgram. Thus, I mention the de Villiers text because it’s an excellent examination of how proof can serve many other purposes. If I have to demonstrate that these other purposes fit your definition of cognitive dissonance in order to have my point /suggestion matter, I’ll pass. I think it’s not hard to do so, but my sense is that you’re more worried about what I take it struck you as a criticism rather than an attempt to ensure that we don’t reinforce a too-narrow notion of proof. Sometimes, the larger context requires that we treat our particular concerns with due caution. Note that I don’t disagree with the idea that the “different” prompt you offered is the one most in keeping with the spirit of mathematical exploration, discovery, etc., and one that has a somewhat better chance of leading students to more than mere going through the motions in order to please the teacher. Giving the end of the story away before anyone has had a chance to even think about possibilities usually seems like a bad idea to me, in and out of mathematics classrooms. In that sense, doubt is a very useful tool. But I really don’t want to feed the conservative/reactionary monster that claims that verification of (almost always already-known facts and theorems) is the sole reason for doing proofs. I’m also unconvinced that lawyers (or even mathematicians) would persist in their professions if the core job requirement were working with two-column proofs. As the possessor of a math degree who has also worked on research, I can say my experience with high school two-column proof not only was useless but actively harmful. It’s not anything like writing or thinking through a real proof. Note also two column proof is a US-only thing. If only more professional mathematicians would publicly refute Simon’s rather hyperbolic and biased piece. While I agree that giving students the opportunity to experience some doubt about the truth of some claim is important, motivating proof seems to be about a bigger idea than that, in part because doubt itself needs to be cultivated. I was a high school geometry teacher in the past and now I work with preservice teachers, and what I’ve observed is that most students don’t really think of writing proofs in terms of communicating their thinking in ways others can follow. The way that I’ve taken to talking about proof in recent years is as a way that mathematicians give little gifts to one another, ideas that they can use to create more mathematics, more ideas. It’s not usually very hard to convince students that there’s some interesting things to be observed in math. The basic story I tell is that people like to notice things. Some things that they observe will seem to be always true, or always true in some situations, or never true in some situations, etc. The thing is, in math, once you find something that seems to be always true, the really cool part is that you often can use that idea to find out more things that are true (or not true, etc). And not just you, but other people too. That’s essentially how math grows. The point of proof is to tell other people about those observations in ways that allow them to make use of your ideas. People are going to want to build on ideas that they feel convinced are good, solid ideas. One of the jobs of the mathematician is to tell other mathematically-minded people about your ideas in ways that will allow them to understand what you’re saying and to believe it. Sure the ideas that we’re noticing in k-12 math might have been noticed and communicated before, but we can both learn about the ideas and about how to communicate ideas by going through this process. Part of the need that I’m trying to create around proof then is the need to communicate one’s thinking in ways that makes that idea useful to someone else. The question is what do they need in order to follow your thinking? How can you communicate your thinking clearly? What do they need to know to be able to believe you? Here’s how I’ve been doing that with my preservice elementary teachers. I do a very similar activity to the one described in the post, but I assign every group a different quadrilateral–kite, rhombus, rectangle, parallelogram, and trapezoid (I always leave the square out of this because I use it as a follow up activity/assessment). Then I do a silly infomercial impression and tell them that they’re going to make an infomercial about their shape. 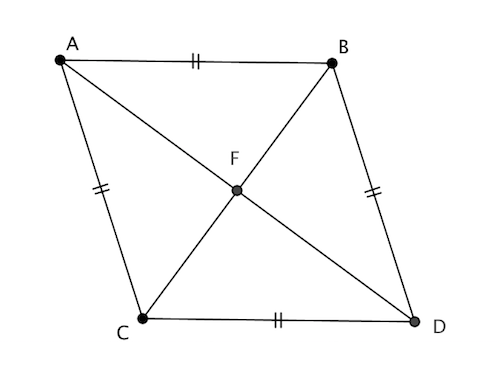 They know the defining property of the shapes at this point (a prior activity), so the motivating question is, given what you know is true about your shape, what ELSE ends up being true or “What else do you get for free?” For instance, what else do you get for free once you know that a quadrilateral has four congruent sides? (“This rhombus has 4 congruent sides! But wait, there’s MORE! It also has 2 pairs of opposite congruent angles! That’s right, you get 2 pairs of opposite congruent angles FOR FREE!”). Anyway, they work in groups to make posters “advertising” their shapes, saying what you DEFINITELY get for free, what you MIGHT get for free, and what you definitely DON’T get for free once you know the given property of their shape. These are our student-made versions of the “always, sometimes, never” lists. The best part of this activity is that the conversations students have while they’re making their posters are often essentially proofs. They’re explaining to each other why, say, it makes sense to say that a rhombus MUST have opposite angles equal. What I do when I hear this is say, “Hey, that’s a really good argument for why you put that there. Let’s write that down so you can remember it to tell other people.” And of course I go around asking them to explain to me how they know various ideas are true/maybe true/never true. Then when I have them share their “infomercials”, I have those groups who wrote out an argument show what they wrote. Follow up activity is for everyone to pick one thing that they believe MUST be true about their shape and write a note to someone in another group explaining why it has to be true and why they can believe the argument (“You might think it’s too good to be true, but it’s not! Here’s why…”). The other group then tries really hard to ask questions back to help them improve their explanations. For me, teaching about proof means motivating both why we’re proving what we’re proving and why we’re writing what we’re writing. Centering the conversation around what can be true, how do we know, AND how can we help other people know this too has been useful. MPG, I don’t think Dan is being defensive. I haven’t read De Villiers’ book, but I just read this, in which he seems to summarize the framework you’re describing. In any case, as a frequent user of proof, I related to each of the list of reasons you gave why people prove things. They are all important and useful to me and part of my understanding of what proof is for. Nonetheless, as an onlooker to the exchange, I had the same question for you that Dan did: it’s opaque to me how you are envisioning using these other frameworks for proof’s purpose to create the kind of cognitive dissonance this series is about, especially with students who do not already know how to create proofs. Why not spell it out a little more? BB-S: Depends upon what sorts of questions students are used to asking themselves or answering from others, doesn’t it? Take the first category, Proof as Explanation. Find some “obvious” or well-known geometric fact (I choose geometry here only because it’s de Villiers’ focus, though I’m sure we could generalize to just about any area of mathematics, K-12 or higher). The first example he offers is the fact that the sum of the distances from a point P to all three sides of a given equilateral triangle is constant if P is an interior point. Why is this true? Students who are used to accepting without question any given statement offered to them by an expert (book, teacher, “smart kid in class” as fact would I believe experience cognitive dissonance at a very fundamental level. “You mean we have to know WHY something is true in math?” If your concept of mathematics is “a series of facts and procedures to be memorized,” as it is for so many Americans, Why? questions seem to me to be precisely the sort of headache that doing proofs can help alleviate. I hope that’s less opaque. I could likely flesh out some or all of de Villiers’ other categories of proof, but the point is simply that there is more than one view of proof in mathematics that fits Dan’s scheme. Why this is such a controversial claim eludes me. I flatly refuse to teach proofs in geometry, believing them a waste of time that is better served beefing up algebra skills. I do demonstrate that “solving for x” is a proof and I go through logic because it’s fun, and it helps kids begin to understand the basics of proof. I only started teaching trigonometry this year, and since I’m not a mathematician I don’t really know all the proofs. But to introduce the notion of proofs, I actually go backwards from the aspirin. I offer up a task that’s individually manageable, step by step, and then it ends with a little mental ice cream cone. The titles of these posts are a tad grandiose, but in both cases I had a point other than the math. Summarized, I give them two cases: rectangle and square have same perimeter, what is the side of square in terms of length/width of rectangle? And then same scenario with area instead of perimeter. That’s a form of proof–which is larger, arithmetic or geometric mean? And the kids are interested in the answer. They do the proof–I kick some of them through some of the algebra, and it’s a great review of solving inequalities. Next day, I bounce off geometric mean to do similar right triangles created when an altitude is drawn to the hypotenuse. They do all that work, too, and then the top kids I push from there to end up with the Pythagorean Theorem. Then I walk everyone through the final steps and *that’s* a kick. The kids really gasp when they realize that all this seemingly just random here’s some stuff we’re working through for the teacher, stuff we *understood*, ends up at the mothership of PT. My proof talks of the actual trig concepts are still not as…organic…as this, where the kids are doing most of the work, as opposed to my talking them through. Right now, the above activities are me 10-15%, kids 85% of work. The Law of Cosines is flipped. But I’m definitely finding more…success in introducing a doable problem that doesn’t seem to go anywhere and have it suddenly go whoa! into something recognizable and interesting. As opposed to trying to create a headache. Make the kids construct semicircles (very simple: mark center, make circle of any size, draw diameter) then pick ANY point on the semicircle & connect it to the ends of the diameter. Ask them to notice and wonder. I bet they’ll see that it’s always a right triangle. Now you prove this algebraically, but what about the visual transformation of rotating the triangle half a turn about the center? I would encourage you to spend a little time with the Rethinking Proof book & Geometer’s Sketchpad. Proof helps build a visual side of mathematical thinking. Students can then usual visual thinking to solve hard problems (like on AMC 12 or AIME) by giving themselves insights into where their algebra needs to go. Oh, I do things like that–not that one specifically, but we do the proof for 180 degrees of a triangle and then all the corollaries. But they aren’t full-fledged lessons and I don’t do any sort of “proof” as take up a chapter or more of a book. As I said, I get them to understand the basics of proof, particularly as opposed to demonstration. And I do it at a much lower level than what I’m working on in trig. Again, the bulk of my geometry students are far more in need of modeling equations using algebra & geometry than they are in need of proofs. Not everyone can translate spatial concepts to thought, or vice versa. I certainly can’t. While the research community may have aligned itself around proof as a mechanism to dispel doubt more than I realized, mainstream teaching and curriculum development resolutely has not. The creation of doubt still seems necessary to me, though de Villiers calls it insufficient. That said, his preferred approach, proof-as-illumination seems thinly sketched to me. In the second paper, he simply proves several theorems he found productive in his class of post-secondary math teacher trainees. That population is only useful to a point. In particular, I don’t know how much that population can teach us about motivation in mathematics. How do we foster in struggling math learners a sense that illumination is a thing to be pursued? thinking ideas like “few people are capable of …” means you’re selling yourself short as a teacher. With Arithmetic Mean-Geometric Mean, you can see from the semicircle diagram that GM<=AM. With constructions, students learn to see ratios in lengths and relationships in areas & volumes. Visual mathematical thinking is learned–just as algebra & modeling are–and teachers can build up students' capabilities to perceive truths visually and build up students' confidence to make conjectures about what they perceive. I love the idea of the aspirin and the headache and all of the posts that have gone with this. I honestly have struggled to get my department that teaches Geometry with me on board with anything like this, proofs included. However, the other course I teach is consumer math with topics like gross pay, taxes, etc. These classes are filled with students that are at the low end of the spectrum for motivation, ability, etc. I would love to incorporate this with them more to see if I could get them more engaged and then also bring this to my department as an example of how this can work even with these students. What ideas could anyone give me for the “headaches” I could create with some of these topics? Thanks! I’m in full agreement with Michael Paul Goldenberg. In addition to the work on proof by the husband and wife team Pierre and Dina van Hiele, I suggest that teachers also take a look at the identification of the various functions of proof by my friend Michael deVilliers. The function of proof in a high school geometry course has traditionally been mostly two-fold: to remove doubt, to convince someone of the truth of a statement –verification and to establish geometry as a mathematical system –systematization. However with our understanding of the van Hiele research we know that these two functions of proof are much higher up on the van Hiele scale and are more successful later in a course. Verification only becomes useful when the property is really questionable. Do we only turn to proof when a property is questionable? I don’t believe so. There are other purposes for proof. Using proof to convince our students of the truth of a conjecture generally falls flat with high school students. When students have investigated a typical situation, discovered the properties in question, and made their conjecture, by then they usually are convinced of its truth. To turn to proof at that point for verification of, as Colbert would say “its truthy-ness” seems a waste of time to students. However, to ask “why?” “How does it fit with what we have already discovered?” seems a more useful and honest purpose for developing a proof. Using proof as a means of explanation, giving insight into what the property comes from, what earlier properties does this conjecture rely on, is a much better role for proof at that point. This is also why I believe a synthetic proof is often preferable to the algebraic or coordinate proofs now being pushed into the geometry curriculum. A synthetic proof will more often reveal the “ancestry” of a theorem over a coordinate proof. The shorter algebraic proof of the Pythagorean theorem using similar triangles is one example. Granted the proof is shorter with a few quick manipulations of symbols but where the theorem comes from, its roots in area, are lost. Students visualize and think of the Pythagorean Theorem as a relationship of areas, not as a result of dropping a perpendicular to the hypotenuse of a right triangle and setting up proportions. @Michael Serra: thanks for that cogent response. I think you get to the heart of the matter. However, to ask “why?” “How does it fit with what we have already discovered?” seems a more useful and honest purpose for developing a proof. I’m left here wondering the same question I wondered when Michael Paul Goldenberg also recommended de Villiers’ writing. If “why?” is the most honest question to ask about proof (and I mean “honest” as in “mathematically honest” or “truest to proof’s historical purpose”) what is the best way to ask it? What are productive ways to involve and interest students in the pursuit of the reason for conjectures that seem obviously verified? I’m sure the question isn’t a theoretical one for you, Michael. @Dan Meyer @Michael Serra: Let’s be careful here. I don’t think anyone is trying to create a truth or usefulness or authenticity hierarchy for proof. Instead, I think Michael Serra was specifically looking at reasons for doing proofs that connect for typical K-12 students. I don’t believe he was claiming that answering questions about why something is true is “the most honest question to ask about proof” in any sense, without any qualification. I would hate to see us arguing over that sort of thing because it’s doubtful that there is any universal viewpoint on such a question, nor does it matter for K-12 teachers what might be true historically for professional mathematicians’ reasons for doing proof (unless those reasons happen to be the same for a lot of K-12 students, a doubtful proposition at best). On the other hand, to draw on the example of inscribed vs. central angles, it seems to me that if we were teaching a more discovery-oriented (or inquiry-oriented) approach to geometry in K-12, students would be inclined already to pose the question “Why are the measures of inscribed angles half the measures of central angles that subtend the same arc?” or something along those lines (maybe just wondering why they are half the measure of the arc they subtend)? On the other hand, if we come at geometry as it was taught when I was in high school (mid-1960s), asking questions was not something students did much. They knew that that was the teacher’s job, as well as answering those questions. A student’s job was to memorize the questions and answers long enough to stand and deliver on the exam, after which for most of us, we could safely forget it. And in the last 25 years or so I’ve spent observing math classes in NYC and Michigan, I can’t recall any student asking a “Why?” question, no matter how teachers might have claimed to be doing something more student-centered, or using books that were supposed to promote student inquiry. Mostly what I have seen is highly-scaffolded “let’s lead ’em by the nose” mini-lessons in which students fill in blanks as they are brought to some conclusion that in the ’60s would have just been stated and then (probably) proved, but trying to get a feeling about why anything was true seemed then and still has seemed in recent decades to be beside the point. I think there has to be a spirit of inquiry inherent in school mathematics from the beginning. It wouldn’t be hard and there’s not a dearth of literature on doing just that. What’s lacking is a sufficiently well-established teaching and learning culture from primary grades on up in which the point of math class is to ask and answer as many why? questions as possible. Instead, we’re still stuck in a drill-and-kill math culture that cares only about little bite-sized problems that can be easily put into standardized formats and used to generate numbers or “data” the purpose of which has little, if anything, to do with learning, doing, or teaching mathematics. I agree with Michael Paul’s comment- especially about the need for “Why”. I want my students to be curious again. That is a powerful part of the 3 act, inquiry type of lessons: kids become curious about their own guesses! And they begin to make guesses about other things – they begin questioning what they think they do know, or what they have “always” accepted as being true. This is a great place for any student to be! Wow, are we math geeks or what. Saturday night and we are writing about proof. Love it! I truly believe teaching is an art. The environment we set up in our classrooms, reducing the math anxiety with humor, games, puzzles, and music, inquiry-based instruction, encouraging questions, nay rewarding questions, goes a long way towards students safely engaging in the “why” process. My students knew they were the ones discovering their geometry. My kids knew they were rewarded for asking questions, and even more so for “good questions.” Whether they are in the midst of problem solving, working on the exercises, or in the midst of creating a proof with their group members, I am walking among the groups listening for explanations. I monitor and reward their explaining why to each other. Proof as a means of verification, as I think we all agree, should happen only when there is real doubt. But I don’t believe we should avoid proof unless there is doubt. I didn’t mean to imply that explanation is the highest form of proof in the high school math classroom but I am convinced the opportunity for that role of proof is more common than verification. This is particularly true in the early portion of a geometry course as students are developing their proofing skills, the content is more straightforward, and they are still low on the van Hiele level of reasoning. For years I tried to come up with intellectually honest ways for students to discover properties inductively (and hopefully the investigation would hint at a method of proof that explains why). Try having students inductively discover the Law of Cosines or Hero’s formula. Good Luck. These are two prime examples in geometry where proof is used as a means of discovery. I explain up front at the beginning of the year to my students what we are going to be doing in my class. Geometry, unfortunately, is usually the only math course in their K-12 curriculum where they will experience a mathematical system. Where they will be asked to explain why they think something is true. I explain that there are a number of purposes for proof and unlike other courses we will experience most of them. Many of the earlier discoveries may seem easy to accept so we will be asking why it is true. “Where did it come from? What other properties is it dependent upon?” Hopefully we will eventually come across some properties, problems, or puzzles that may not seem obvious and our goal then will be to determine whether or not it is true, and if true, hopefully show how this property fits with other properties we have previously established as true. In fact in doing this we will be sort of recreating the historical development of geometry. The Great Pyramid was built in 3900 B.C. by rules based on practical experience: Euclid’s system did not appear until 3,600 years later. It is quite unfair to expect children to start studying geometry in the form that Euclid gave it. One cannot leap 3,600 years of human effort so lightly! The best way to learn geometry is to follow the road, which the human race originally followed: Do things, make things, notice things, arrange things, and only then –reason about things. True, the CCSS claim that by high school, students will be operating at the highest level of reasoning and will have already gone through these stages of development. We shall see. Let’s revisit the cliché example: they discover the sum of the measures of the interior angles of a triangle to be 180° usually by measuring the interior angles and calculating their sum (I still advocate this because that is what kids suggest when asked, how can we find out?). This gives something in the neighborhood of 180° and they all believe it. (However, nothing about simply adding up the measures reveals why it is true, or what properties this property is dependent upon?) Thus I insist we follow that with yet another investigation in which we cut out the triangle, tear off the angles and arrange them to get their sum. In addition to confirming their conjecture, it potentially becomes an aid in their explanation. When someone notices that some of the arrangements of the angles create a line parallel to a third sides it leads to the explanation that the triangle sum comes from the parallel properties. Dan has found the Pythagorean theorem to be such a very important property of right triangles and is wondering if there is a similar relationship with rectangles. Annie, with a twinkle in her eye, suggests to him that the sum of the squares of the four sides of a rectangle is always equal to the sum of the squares of the two diagonals. Is this true? How does she know so quickly? Prove it. Dan was able to prove that the sum of the squares of the four sides of a rectangle is equal to the sum of the squares of the two diagonals. Then he thought, maybe it is true for any parallelogram. Is it? Either prove it is true or find a counterexample. After seeing Dan’s proof that for any parallelogram the sum of the squares of the four sides is equal to the sum of the squares of the two diagonals, Annie wondered if it was true for any convex quadrilateral. She has challenged Dan to prove it! Help Dan prove it or find a counterexample that proves it false. FWIW, it doesn’t seem incompatible to me – before this move – to also ask students to draw any inscribed angle and its central angle and see if they notice anything interesting and if that interesting thing recurs in their classmates’ drawings. Dan Meyer: I have no problem with what you describe. Lots of ways through the woods, and you have to teach the students you have, not the ones you wish you’d been given. A lot of teachers seem to struggle with that fact, whether it manifests itself as resentment because they don’t have kids who are, ahem, “mathier,” or just that they don’t have students who are adequately prepared for the material that the current teacher is expected to teach. But even some of us who think of ourselves as progressive, student-centered, etc., struggle at times with the tendency to blame student attitudes towards discovery, exploration, or anything non-routine on their past teachers. While that may be true, there’s nothing we can do about that NOW, for THESE kids other than to find ways to get them moving in a better direction. I know that there are, happily, a significant number of young teachers who invest a lot of time, energy, and thinking into how to get that done. I find a lot of hope to be gleaned from reading the ideas being shared on the ‘Net about that. It’s fairly amazing, in fact, given some of the forces in contemporary education working against that sort of thing. I think comments #30, 31, 33, 34, and 35 establish a lot of common ground, and the conversation seems to have pretty much wrapped. So perhaps I’m out of line but I’d like to pick the thread back up for a moment, because I hear a note in Dan’s line of thinking that resonates with me and that I want to make sure gets its due. I think that MPG and Michael Serra you are likely to relate, if I can succeed in moving the conversation out of the frame given it by de Villiers’ question “Is proof about verification or other things too?”, a frame which I enjoyed very much while reading the de Villiers articles, but which in this context seems to me to drown out the note I’m hearing in Dan’s thinking and trying to amplify. One of the things I’ve always responded to in Dan’s writing about pedagogy is the concern with what I’ll call the primal urgency of a math lesson. Dan I just spent a few minutes unsuccessfully searching for an old post of yours in which you had an image of some people whitewater rafting, with a caption something like look at the fun they’re having. You used this image as a metaphor for what you wanted math class to feel like. To me this image captures the theme in your thinking I’m trying to highlight. Whitewater rafting is a lot of fun, but another thing about it is that it’s very hard for [your body] not to go where [the river] wants you to go. You’ve always been most interested in math lessons where, not only is it a lot of fun, but it is actually very hard for [your mind] not to go where [the lesson] wants you to. What I hear you inquiring into with this post is how can we give proof this sense of primal urgency (or as close to it as possible) for people who are completely new to it. Your proposal is that doubt has a distinguished role to play in accomplishing this goal. I agree. I actually have a lot of conviction about this, based on the sum total both of my own classroom experience and a fair amount of experience in other people’s classrooms. I blogged about it recently (in response to this post) and less recently. I want to have due deference to the classroom experience of the people I’m conversing with, which (except for Dan) is more than mine – I’m not trying to establish any authority with this, I just wanted to say where I’m coming from. (I.e. this is not a theoretical point for me, any more than it is for any of us.) In fact, Michael Serra, based both on my sense of your corpus of work as a whole and on your “Dan and Annie” example above, I’m inclined to think that *you* might agree too, even if you’re not thinking about it this way. This reason for proving has been identified in this conversation as “verification”, but that’s the wrong word. You verify something you already *mostly* believe. The more legitimate the uncertainty, the less appropriate that word, and I’m championing as much legitimate uncertainty as possible. It’s the consistent lesson of my experience that novice provers have trouble accessing deductive trains of thought when they already have conviction, and that those same novice provers naturally gravitate to deductive trains of thought, almost like they can’t avoid them, when they honestly don’t know what to believe and want to know. Lack of initial participation in the actual activity of explaining (proving) has also been reported by teachers who have tried out some of these ideas at school level, and it appears that, in our experience, only after considerable concerted exposure to work of this kind do students become proficient in constructing their own explanations and critically comparing them. The thing is that the structure of deductive proof is given by the intention to dispel doubt. We’ve developed that structure over the centuries, and now (as de Villiers very convincingly argues) we use it for a wide range of purposes, and we very often find our conviction without it, but it’s still the case that how we (1) identify a proof, and (2) measure its validity, are given by the need for it to convince a skeptic. (Usually an imagined one.) We’ve chosen to use proof as a tool to understand, to give insight into reality. But the test of whether it’s a proof is not whether it gives insight, or does any of the other things de Villiers talks about. The test is whether it convinces a skeptic. My point is that to use proof for any of the purposes de Villiers discusses, you need to know how to generate and/or evaulate proofs when you already have conviction, and that means you need to know how to serve as a skeptic even when you already have conviction. The problem is that novice provers straight-up don’t know how to do this. On the other hand, when you really don’t know, and you really legitimately have to convince yourself, then you were actually legitimately a skeptic, so whatever you did to convince yourself is probably already pretty close to a proof. Even better if your classmate then doesn’t believe you and you have to convince them too. My experience is that students, even ones who are totally new to proving, who settle something for themselves they were legitimately uncertain about, more or less produce proofs without needing to be asked, or instructed in what a proof is or looks like. This way they can learn what a proof is and what it looks like while they are busy doing something they feel a primal urgency to do, which is figure out what the hell is going on. To summarize, I’m arguing that legitimate uncertainty has a distinguished role to play both in giving proof primal urgency and in giving students a basic understanding of the structure of the task. And this is also what I took Dan to be pointing toward. p.s. Michael Serra, you point out that opportunities for proof as explanation abound much more than opportunities for proof to really settle a legitimate question. I’m with you on this. But I’m making a case for pushing the legit-question opportunities to the front of the queue. Imho these are the ones students should be cutting their teeth on. Once you grok the structure of proof and you learn how to be your own skeptic, then all of de Villiers’ other reasons for proving can come into play. I’m just making the case for the importance of uncertainty when you’re learning the structure. p.p.s. To circle back to something: Michael Serra, what I meant about “you might agree based on your Dan/Annie example” was that the way you asked the question seemed designed to stimulate as much uncertainty as possible under the circumstances: not “prove this” but “Is this true?” / “Prove or give a counterexample.” So I already see you valuing the cultivation of legitimate uncertainty in how you frame the task. p.p.p.s. One last aside: I think this is probably already clear but I just want to say that the pedagogy de Villiers is most explicitly arguing against (pp. 371-374 of the second article MPG linked) is unrelated to anything anybody in this conversation is talking about. As Michael Serra said, I don’t think anybody here thinks there’s any good to be had from telling students that they’re trying to dispel doubt when they don’t have any. de Villiers is discussing a scenario in which the teacher shows students examples of various things more or less unrelated to the work they will be doing, in an effort to bully them into not trusting their own sources of conviction. What I’m talking about is the opposite: tapping precisely into their own sources of conviction as the primal wellspring of their understanding of proof. In looking back, I think all these exchanges have ignored “the elephant in the room,” the addition of dynamic geometry software, e.g. The Geometer’s Sketchpad, to the geometry classroom. For over 40 years I’ve advocated and practiced a discovery classroom where students performed investigations and made their discoveries. They arrive at their own definitions and geometric properties and slowly begin to develop proofs for them. When I was a beginning teacher I believed they should discover everything by compass and straightedge thus their discoveries would be supported by Euclid. I learned from these early classroom experiences that relying on Euclidean constructions was needed for me not them. My students early on taught me that it would be easier, faster, and more convincing to use other tools such as ruler, protractor, scissors, folding, tracing, etc. Eventually I added patty paper to my set of discovery tools. All of this was based on a simple pedagogy of CONCRETE–>PICTORIAL–>ABSTRACT. Working in groups of four, students would have four similar conjectures from their investigation. With ten or more groups coming up with the same conjecture it seemed even more convincing. They felt there was enough evidence to convince themselves that their conjecture was true but I felt there was not enough evidence to have certainty. Thus I thought I had the necessary hook to ask, “How do we know for certain?” However, when Sketchpad (GSP) came on the scene, that strategy took a hit. Now with GSP students were able to quickly construct a circle, construct a central angle and an inscribed angle intercepting the same arc. Measure the central angle and the inscribed angle. Drag the vertex of the inscribed angle and observe that the measure of the inscribed angle is always half the central angle. When students see this happen, in their eyes, “infinitely many times” not just four cases, it is more than just convincing. Students would look at me, roll their eyes and say, “how much more proof do you need?” That is certainly compelling to any classroom skeptic. The not knowing, the bit of doubt that may have existed prior is dispelled by dynamic geometry experimentation. The primary and traditional role of proof in the geometry class has changed. The three proof exercises I offered in the last posting are three very different but linked examples of situations for exploration/explanation. The third one announces that the first two were both true! Suggesting that there may be a bigger idea going on here and this one is true as well. But alas, a quick exploration with dynamic geometry and counterexamples are easily found. As an aside, let me also add, I very much like Dan’s idea of “story” in our classrooms. I think this is a clever devise. It reduces the math anxiety, builds rapport and adds humor/interest to many topics including proof. Having themes such as the three exercises above adds to the opportunity of ongoing stories in your classroom. I have a character in my textbook archaeologist Ertha Diggs that appears numerous times throughout the course. I use her as an ongoing story. I share that Ertha and I were out on a dig again this past weekend and guess what happened? Then I would present a piece of broken regular polygonal plate that I claim to have found on our dig. How can we figure out the original number of sides? Or from another dig, I bring in a stone in the shape of a trapezoidal prism (actually a Chinese take-out carton covered in glue/sand). How many of these made up the arch that I suspect it came from? And on and on. I encourage classroom teachers to incorporate more and more “stories” via videos and images and use these grabbers to generate enthusiasm and perplexity. But I think the perplexity will more often be resolved by experimentation and not deductive argument. People who are only good with hammers see every problem as a nail. I’m certainly not advocating only using dynamic geometry software (I’m actually a bigger fan of patty paper explorations). One of my goals in a geometry course is to introduce a variety of geometry tools and eventually students can reach a comfort level with all of them and be able to decide what tool to use in any particular exploration. Another is that proofs are like describing a route, and this is in a certain landscape. How much detail should you give when describing a walk to the station? I’m jumping in late and mostly restating with slightly different language. Doubt is an excellent headache motivating the aspirin of proof. For those situations where a conjecture can be formulated that is questionably true, proof is an excellent aspirin. Understanding is also a headache which can motivate some kinds of proof. Students ask “Why do I do that?”. They ask, “How do you know?” They ask “Why does it work?” These are the basic questions underneath most understanding. Some proofs that I think are especially appropriate for high school students are very helpful here. Studying the proofs does a lot of work toward understanding “why”. Reciting the proof or a variant of the proof gives a decent amount of evidence of the understanding. Explaining the proof gives even more evidence. I think that proof meshes very well with maker culture. I think maker culture is showing us that people have a natural drive to dig through magic and to take things apart and to see why they work. Magic is a headache. Proof is the path in the sand left behind when one takes apart a beautiful mathematical truth to see why it works. I love having students make up a list of conjectures, which often gets them thinking about why it’s true, and they start coming up with different reasonings for it. As an example, I gave a list of the first ten [Chebyshev Polynomials of the first kind](https://brilliant.org/wiki/chebyshev-polynomials-definition-and-properties/#coefficients-of-chebyshev-polynomials-of-the-first-kind), and then had them list out their conjectures about the coefficients. We then talked about why these were true, which helped them develop a better appreciation for the theory (both from the functional equation, and from the cos polynomial). And I acknowledge that my previous comments didn’t take account of GSP. To clarify my context, I have never taught a geometry class. When I wrote, “It’s the consistent lesson of my experience …,” the experience I’m referencing has all been in the context of teaching (a) high school algebra, algebra II, and calculus, (b) summer enrichment courses in number theory and group theory for middle schoolers, and (c) private tutoring at a variety of levels. In none of these contexts did students have access to a technological source of conviction parallel to GSP, so I’m not personally familiar with the set of constraints that imposes. However. Dan’s original post is not about how to teach geometry but about how to teach proof. The point I’m at pains to make here is about how people who don’t know how to create proofs can best be supported in learning how to create them. I’m arguing that in order to learn this in the first place, students are best served by having real uncertainty and then using deduction as a tool to resolve that uncertainty. For all the reasons I’ve given above and in the linked post: the structure of deductive proof is determined by its at least formal intention to dispel doubt, so students who don’t know where to look for it or what it looks like can most easily look for it, see it for the first time, and experience it as meaning something, if it is actually dispelling their doubt. The easiest scenario is if deduction is the most efficient available tool for resolving the uncertainty. That’s what I had in mind: when students’ desire to figure out what’s going on leads them to deduction as if by force. On the other hand if students have available another powerful tool for gaining conviction, such as GSP, then that’s great for developing geometric intuition, but from the point of view of empowering students to create proofs, it creates a new pedagogical challenge, as you describe (“… that strategy took a hit”). You’re talking about, “how does this fact change geometry class?” But I’m not focused on geometry class, I’m focused on proof: we want students to engage in deduction – how do we motivate and empower it by making it a tool they need? What I’m arguing is that for kids new to deduction (in a mathematical context anyway), it won’t become a tool they need unless they have some sort of active, “what’s true”-typed question they are using it to try to answer. (Not just “why is this true?” That’s too abstract.) This is what my experience teaches me. Part of my enjoyment of the Dan/Annie series of problems is the way that by the end (at least as I’m imagining it), students have a question about which there is real uncertainty in the room: for which convex quadrilaterals does this sum-of-squares relation hold and for which doesn’t it? This uncertainty may or may not motivate and empower deduction. If students are not interested to get to the bottom of it, it’s a non-starter. But even if they are, if they can mess around in GSP and come up with an if-and-only-if conjecture that holds as they slide the diagram around randomly, then conviction has been formed without deduction once again, and the students have no reason to start trying to deduce. But if it happens that students want to sort out the question and yet an if-and-only-if conjecture is not forthcoming, then deduction might be a helpful tool in looking for the right conjecture. If it works like that, then this type of sequence is a tactic we can use to motivate and empower deduction: get students interested in a question to which the answer won’t be found by randomly forming and testing conjectures, but may be able to be found through deduction. Then students have a reason to deduce. Perhaps this was what the questions were designed to accomplish?